The following are selected short and long-term art and animation projects created for and with children, youth, and adults. Marc Making is an art program created for adults with developmental disabilities at Marcfirst, where I worked as a DSP, job coach and, the program coordinator. Since Spring of 2017, Marc Making partnered with the University Galleries of Illinois State University to give the Marcfirst artists an opportunity to create paintings, drawings, collages, small sculptures, and photographs through workshops at the Galleries. The works were exhibited from June 2 to August 9, 2017. While working as a program specialist at Boys and Girls Club of Bloomington (BGCB), I was asked to organize and facilitate a week-long animation workshop for interested students. Because of some organizational intricacies, only five students volunteered to be a part of the workshop and the meetings took place over a three day period for an hour each day. Each day, the participants worked as a group on a stop motion animation. After receiving the Best of Show Award at the Rockford Biennale in 2014, I was asked to create and facilitate an animation workshop for young participants, ages 5-14. During a three-hour-long session, they created the above animation. I facilitated a weekly series of animation workshops at Western Avenue Community Center’s after-school program in Bloomington, IL. Each session consisted of cognitive, social, and emotional elements, respectively assigned to watching and learning, creating, and discussing the final product—animation. Participants created four animated shorts: individual self-portrait animation, 'hero's journey' created in pairs, group animation "commissioned" by the Western Avenue to promote a Cinco de Mayo fundraiser, and another self-portrait concluding the workshops. This animation workshop was created at Home Sweet Home homeless shelter in Bloomington, IL with one adult individual. Although, the workshops started with a stop-motion animation, the participant's interests led them to create a traditional hand-drawn short. Public Practice is an artist-run organization co-founded by me and Jason Judd in 2014. Public Practice’s mission is to provide smart, engaging, yet challenging creative programming and art to the Rockford community and beyond. Through the spirit of collaboration and grassroots/DIY organization, Public Practice acted as a springboard for creative endeavors that are in tune with its pedagogical mission. 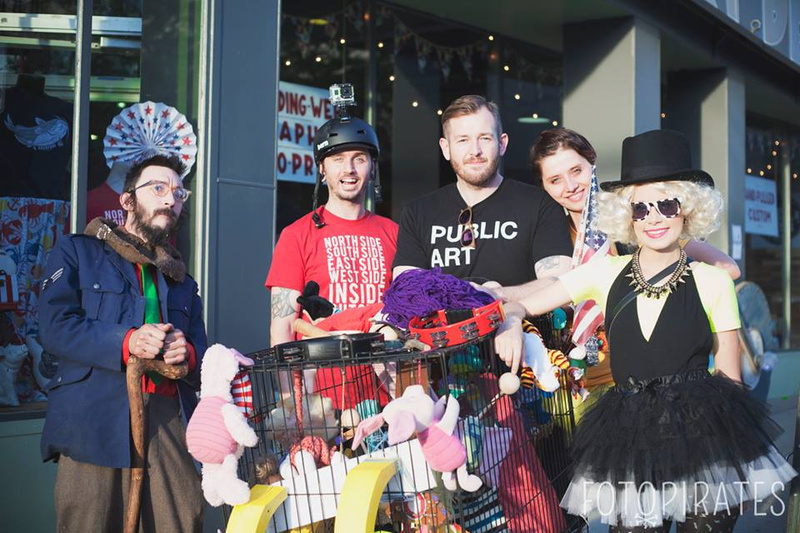 The Art Parade was one of the projects facilitated by Public Practice. This project took place from February until May of 2016 at Asian Human Services in Chicago. I worked with an art therapy group that focuses on supports for immigrant and refugee participants. Under the supervision of the head art therapist, Ha Tran, working alongside leading art therapist, Su Jin Eimer, I created and facilitated a weekly animation workshop with a group of five to ten adult participants. They created a stop-motion short about their shred experience of immigration and assimilation in a new country. The new partnership between the School of the Art Institute of Chicago and the Foundation for Homan Square in North Lawndale has provided the unique opportunity to engage with art as a social practice. What’s the Word? was a four-week workshop during which students from DRW College Prep collaborated with students from the School of the Art Institute of Chicago to conceptualiz and execute a mural that incorporates stop-motion animation. This public art project both utilized the space and activated the interaction between the audience and artists. Working with the high school students at DRW College Prep was a great way to channel their creativity, build interest and ownership of the public artwork right in their neighborhood.